Chemical methods of transfection that have proven successful with cell lines often do not work with primary cultures of neurons. Recent data, however, suggest that linear polymers of the cation polyethyleneimine (PEI) can facilitate the uptake of nucleic acids by neurons. Consequently, we examined the ability of a commercial PEI preparation to allow the introduction of foreign genes into postmitotic mammalian neurons. Sympathetic neurons were obtained from perinatal rat pups and maintained for 5 days in vitro in the absence of nonneuronal cells. Cultures were then transfected with varying amounts of a plasmid encoding either E. coli β-galactosidase or enhanced green fluorescence protein (EGFP) using PEI. 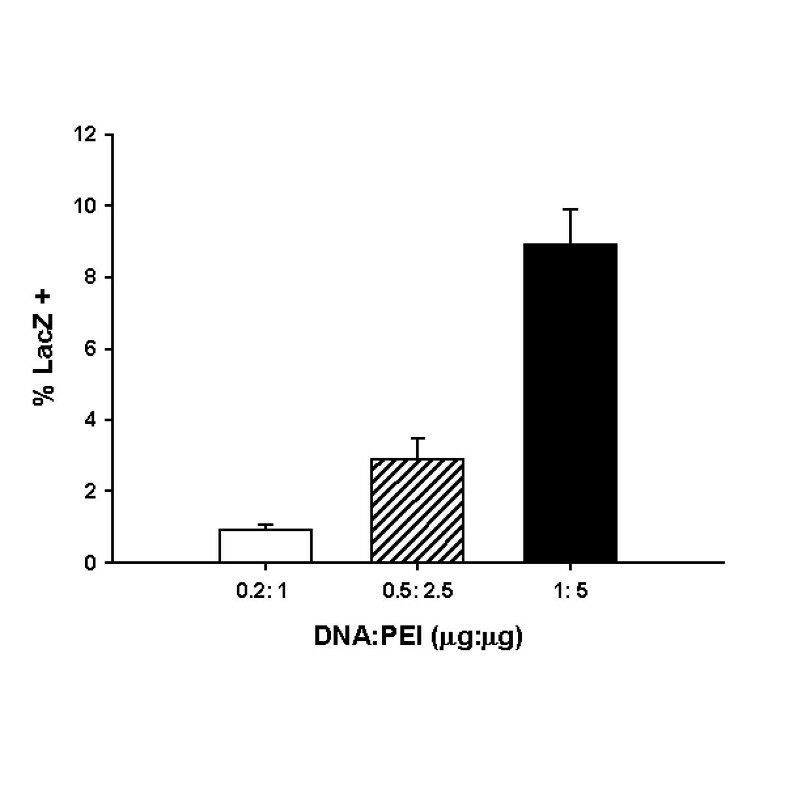 Optimal transfection efficiency was observed with 1 μg/ml of plasmid DNA and 5 μg/ml PEI. 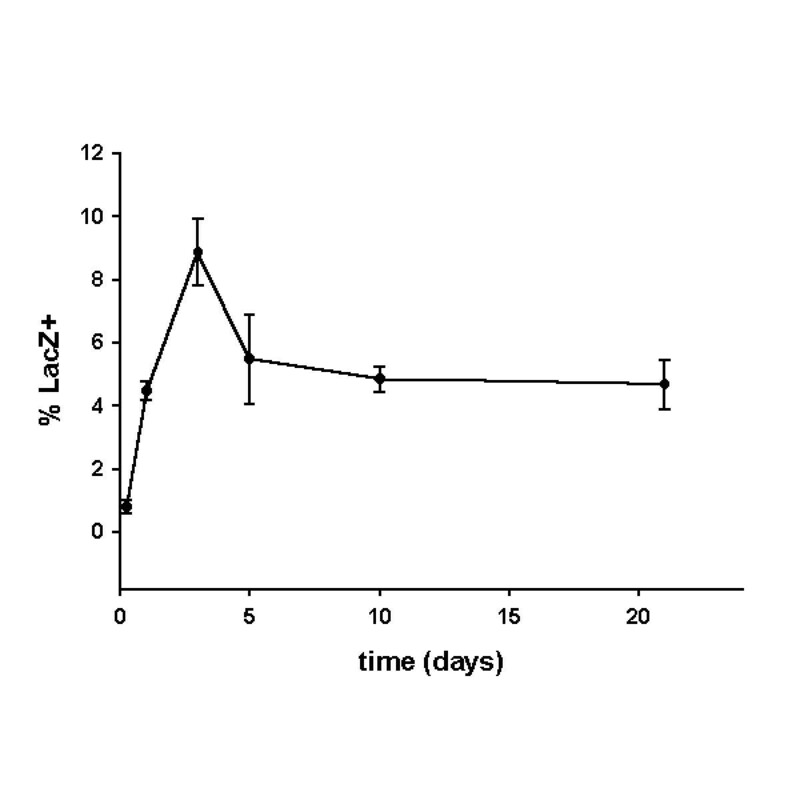 Expression of β-galactosidase was both rapid and stable, beginning within 6 hours and lasting for at least 21 days. A maximum yield was obtained within 72 hours with ∼ 9% of the neurons expressing β-galactosidase, as assessed by both histochemistry and antibody staining. Cotransfection of two plasmids encoding reporter genes was achieved. Postmitotic neurons from adult human retinal cultures also demonstrated an ability to take up and express foreign DNA using PEI as a vector. These data suggest that PEI is a useful agent for the stable expression of plasmid-encoded genes in neuronal cultures. Although intense efforts are being directed toward the development of safe and effective viral vectors that permit the introduction of foreign genes into mammalian cells, chemical transfection continues to attract interest, not only because chemicals are less difficult to use from a technical standpoint, but also because this form of gene transfer may prove less toxic and immunogenic from a therapeutic perspective . Synthetic vectors include cationic polymers such as polyethyleneimine (PEI) and polylysine, as well as cationic lipids such as Lipofectamine  and negatively charged liposomes . The unique chemical properties of PEI underscore its potential as a vector for gene delivery. For example, PEI has a very high cationic charge density, making it useful for binding anionic DNA within the physiological pH range  and forcing the DNA to form condensates small enough to be effectively endocytosed , which is the primary mode of the PEI/DNA complex into the cell [1,6,7]. Via the endosomal compartment, PEI/DNA complexes travel to the nucleus, whereupon the plasmid DNA is expressed within 5 hours after the initial attachment of the complexes to the cell surface . Another property of PEI that makes it suitable as a DNA vector is its structure, in which every third atom is a protonatable amino nitrogen that allows the polymer to function as an effective buffering system for the sudden decrease in pH from the extracellular environment to the endosomal/lysosomal compartment. This feature is important for the protection of genetic material as it travels to the nucleus [4,7]. Over 30 cell lines have been successfully transfected using PEI, including COS-7 cells , rat hepatocytes , human dendritic cells [9,10], and mouse mammary epithelial cells . Especially exciting is the ability of PEI to introduce foreign genetic material into fully differentiated, postmitotic cells in vitro. Such examples include mouse myotubes  and chick embryonic neurons . Lambert et al. also demonstrated PEI-mediated uptake of nucleic acids in rat sympathetic neuronal/glial cocultures in serum-supplemented media. In this report, we describe the application of PEI in the transfection of postmitotic rat sympathetic neurons in serum-free, glia-free conditions, thereby showing the capability of PEI as a method for studying the effects of targeted genetic manipulation in a rigorously defined cell culture system. In addition, we show that foreign genetic material can also be introduced into human retinal neurons that are decades old. Transfection conditions were optimized using cultures of postmitotic sympathetic neurons that had been treated with a DNA synthesis inhibitor to remove nonneuronal cells. Neurons were transfected on the fifth day in vitro. Three days after transfection, β-galactosidase (β-gal) activity was detected in a subpopulation of sympathetic neurons (Figure 1A and 1B). Labeling was present in both the soma and processes. Labeled axons could be followed for many millimeters, and growth cones were consistently labeled. β-gal protein could also be detected using immunocytochemical methods, and the labeling pattern was identical to that detected using X-gal (Figure 1C). 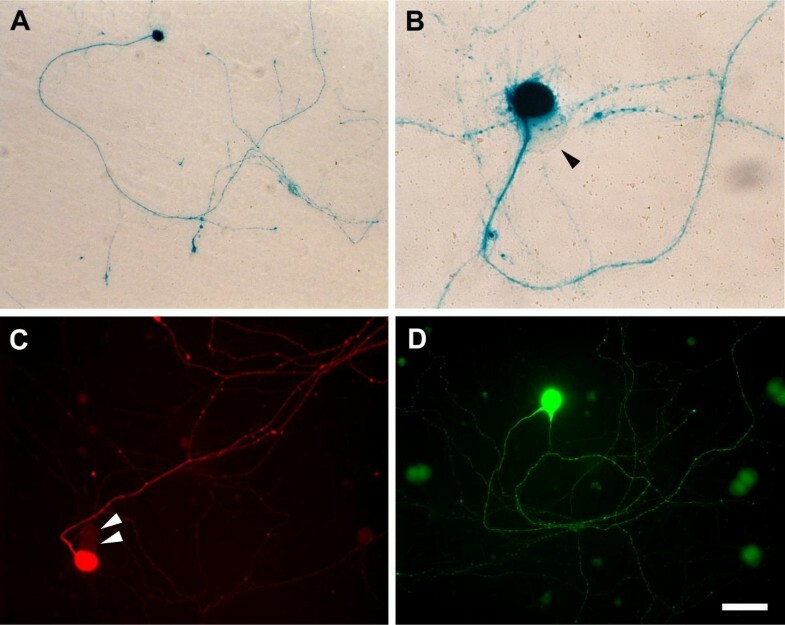 Another gene that is commonly used to identify transfected cells, EGFP, was also successfully introduced into sympathetic neurons using PEI (Figure 1D). As with β-gal, EGFP was detected throughout the neurons, including synaptic varicosities and growth cones. Rat sympathetic neurons express β-galactosidase and EGFP genes transfected using PEI. 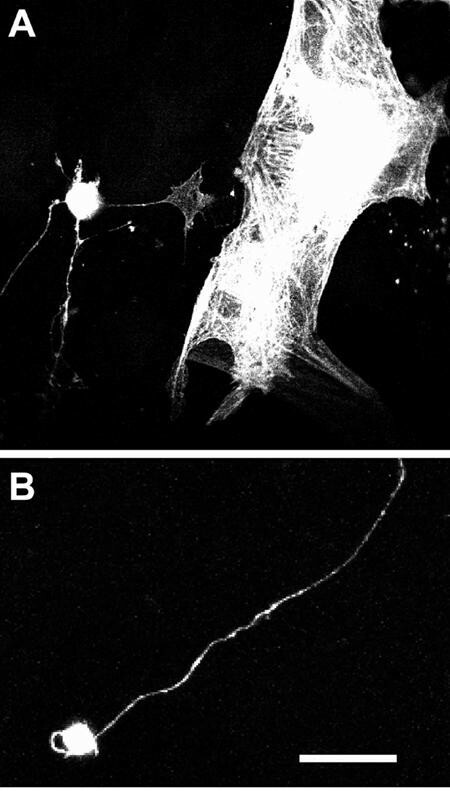 (A) and (B) show a transfected neuron stained with X-gal 10 d after introduction of plasmid taken at low and high magnification, respectively. In (A), note the extensive spread of β-galactosidase throughout the neuronal processes, including growth cones. In (B), note the non-transfected cell immediately adjacent to the soma of the β-gal+ neuron (arrow). (C) shows a neuron stained with a monoclonal antibody to β-galactosidase next to two nontransfected cells (arrows). An EGFP+ neuron is shown in (D). Note the distribution of EGFP throughout the neurites in (D). Scale bar = 80 μm in (A), 20 m in (B), 40 μm in (C) and (D). Pretreatment of our cultures with cytosine-D-arabinofuranoside prior to transfection almost completely eliminates the presence of nonneuronal cells . To further demonstrate that the transfected cells in our cultures are neurons, we transfected cultures with the plasmid encoding EGFP, and then immunostained them using an antibody for microtubule-associated protein 2 (MAP2), a neuron-specific marker. Ninety-five out of 100 EGFP+ cells were also MAP2+ (Figure 2), indicating that the vast majority of transfected cells in our cultures are neurons. Those few cells that expressed EGFP but not MAP2 possessed a clearly distinct morphology from the neurons, such as smaller size and shorter processes, and thus were easily distinguished from neurons in subsequent experiments. Cells transfected with PEI are primarily neurons. Cells were cultured as described in "Methods." On the fifth day in vitro, cultures were transfected with the plasmid encoding EGFP. Eight days later, the cultures were immunostained with an antibody to the neuronal marker MAP2. (A) shows a cluster of three cells, with the one on the right expressing EGFP (green). (B) indicates that the cells in (A) are MAP2+ (red). Scale bar = 20 μm. 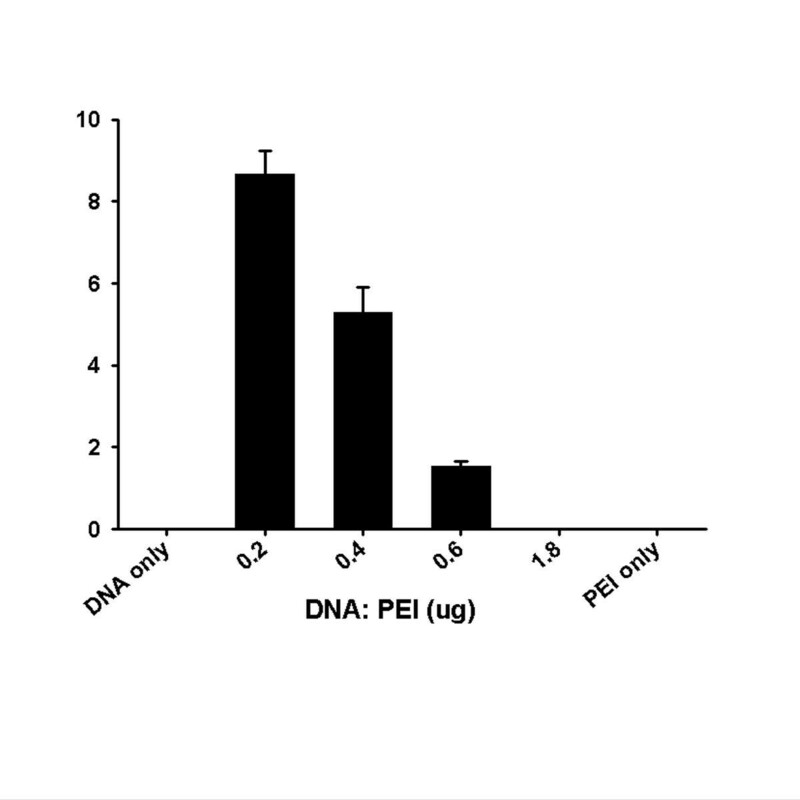 Consistent with previous results [4,8,9,15,16,], we found that the β-gal transfection efficiency varied according to the ratio of DNA to PEI (Figure 3). Peak yield was observed at a ratio of 1 μg plasmid DNA to 5 μg PEI (concentration of PEI stock is 1 μg/μl) in 1 ml culture media, producing ∼ 9% transfected cells. As the number of protonatable nitrogens on the linear 22 kD ExGen 500 PEI polymer at physiological pH is roughly equal to 5.47 nmol per μg PEI, and 1 μg DNA corresponds to 3 nmol phosphate groups, this means that the peak yield observed was at a PEI nitrogen: DNA phosphate (N/P) ratio of ∼ 9. Thus, the most suitable N/P ratio for in vitro sympathetic neurons appears to be around 9, creating positively charged DNA/PEI complexes . 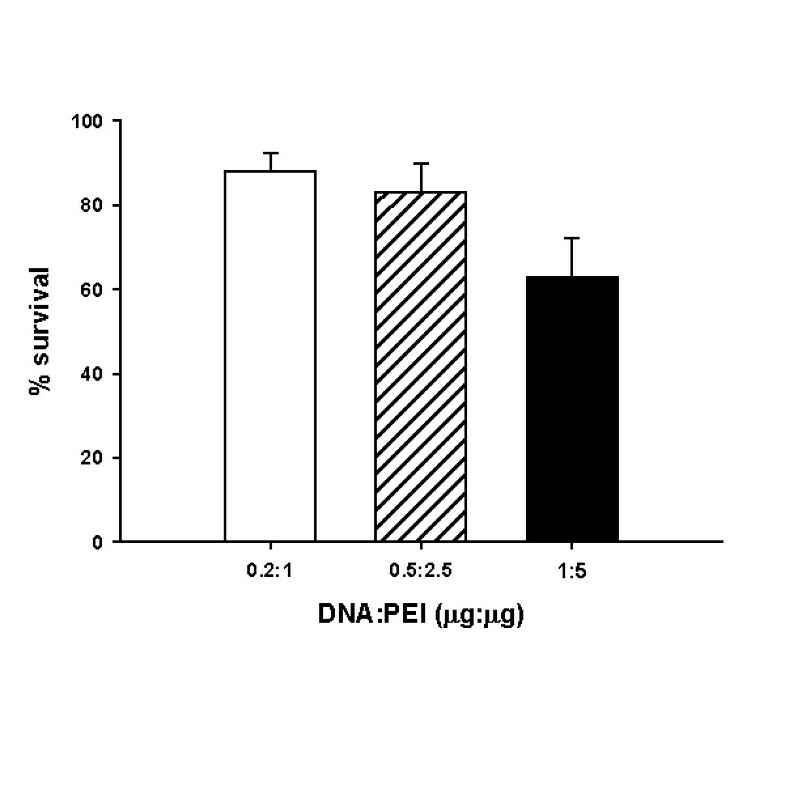 Transfection efficiency depends on the DNA: PEI ratio. Rat sympathetic neurons were cultured in 12-well plates and transfected as described in "Methods." Various ratios of μg DNA to μg PEI (0.2, 0.4, 0.6) were used, as well as DNA alone (2 μg) and PEI alone (5 μg). Three days post-transfection, cells were fixed and stained with X-gal. The number of cells expressing the plasmid encoding for β-galactosidase (LacZ+) was counted and expressed as a % of total cells scored (N>500). Data are expressed as the mean of three separate wells ± SEM. The percentage of β-gal+ neurons varied according to the total amount of DNA/PEI complex added to the cultures. Keeping the 1: 5 DNA: PEI ratio constant, lower yields were obtained at 0.2: 1 and 0.5: 2.5 DNA: PEI (Figure 4). Toxicity increased at higher overall amounts of DNA/PEI (Figure 5). Efficiency of PEI-mediated gene transfer is dose-dependent. On the fifth day in vitro, sympathetic neurons were transfected with 0.2: 1, 0.5: 2.5, or 1: 5 μg DNA: μg PEI. Three days later, cells were fixed and stained with X-gal. Neurons expressing the plasmid encoding for β-galactosidase (LacZ+) were counted and expressed as a % of total cells scored (N=500). Data are expressed as the mean of three separate wells ± SEM. Toxicity of PEI-mediated gene transfer is dose-dependent. On the fifth day in vitro, sympathetic neurons were counted on an inverted phase-contrast microscope (20x) and the total number in each well was estimated from a random sampling of 20 microscopic fields per well. Cells were then transfected with 0.2: 1, 0.5: 2.5, or 1: 5 μg DNA: μg PEI. Three days later, cells were fixed and counted again, pairing the post-transfection cell number in a well with its corresponding pre-transfection number. Data are expressed as the mean % cells surviving transfection of three separate wells ± SEM. Sympathetic neurons were transfected with β-gal plasmid and PEI (1 μg: 5 μg ratio). At various times thereafter (6 h, 1 d, 3 d, 5 d, 10 d, 21 d), cells were fixed and assayed for the presence of β-galactosidase activity. β-gal+ neurons were detected as soon as 6 h post-transfection (Figure 6), a finding consistent with previous work . A maximum of ∼ 9% β-gal+ neurons were observed at 3 d post-transfection with 1: 5 DNA: PEI, followed by a progressive decrease from 3 d to 10 d. During this time, many β-gal+ neurons appeared to either die or cease expression of the foreign gene. However, the percent of cells expressing β-galactosidase at 10 d (4.8%) was similar to the percent at 21 d (4.7%). This suggests that the neurons that still expressed β-galactosidase by 10 d continued to do sothrough 21 d. Therefore, PEI-mediated β-gal expression in a certain percent of neurons is persistent. Kinetics of PEI-mediated transfection. Perinatal rat sympathetic neurons were transfected with 1 μg LacZ plasmid and 5 μg PEI after five days in vitro. At various times following transfection (0.25, 1, 3, 5, 10, and 21 d) cells were fixed and assayed as to the presence of β-galactosidase using X-gal histochemistry. The % neurons expressing β-galactosidase (LacZ+) were determined by counting 500 cells per well and expressing the data points as mean % LacZ+ neurons of three separate wells ± SEM. To determine how efficiently co-transfection occurred with PEI, we used β-gal and EGFP together in a 1: 1 ratio, with the overall DNA: PEI ratio at 2 μg plasmid DNA: 5 μg PEI/ml culture media. Neurons expressing EGFP were also found to express β-galactosidase (Figure 7). 23 out of 24 transfected neurons examined clearly demonstrated expression of both plasmids, indicating that co-transfections are reliable using this method. Cultures of cells dissociated from adult human retina were transfected with plasmid encoding EGFP after 1-4 weeks in vitro using the same protocol developed for sympathetic neurons. A variety of cells were transfected, most notably glia (Figure 8A). Smaller, process-bearing cells expressing EGFP were also detected (Figures 8A and 8B); these cells possess a morphology that strongly suggests a neuronal origin. Similar types of cells were able to express the β-gal plasmid as well (not shown). Our data demonstrate the utility of polyethyleneimine as a vector for exogenous gene delivery in cultured neurons. Although the sources of the neurons varied widely in age and species, PEI was nonetheless able to facilitate the expression of at least two foreign genes, LacZ and EGFP, in each of the experimental settings. This finding underscores the versatility of PEI as a method for introducing genes into postmitotic populations of cells, particularly as our previous efforts to transfect sympathetic neurons using lipid-based reagents (Lipofectamine and Lipofectin) had been unsuccessful. From a technical standpoint, PEI is relatively straightforward, as commercial preparations are sterile and ready for use. There are, however, important factors to consider while striving for optimal results. The first is maximizing yield and minimizing toxicity. Although the reasons for PEI toxicity are not completely clear, it appears to involve the disruption of the endosome/lysosome complex [4, 6]. In our experimental conditions, the optimal density for transfection of rat sympathetic neurons is around 30 neurons/mm2, in contrast to a typical culture density of 10 neurons/mm2 . This allows for sufficient numbers of transfected cells and appears to lessen the PEI burden per neuron, yet does not preclude detailed morphological analyses of individual neurons. Another factor is the presence of serum. Based on our unpublished observations, rat sympathetic neurons that are transfected in the absence of serum show much greater toxicity than those in which 2.5% serum is temporarily added for the transfection process (data not shown). Furthermore, the presence of serum does not seem to greatly interfere with the transfection process of either rat sympathetic or human retinal neurons, although in other cell types it sometimes does [18,19]. Rinsing the cultures immediately after centrifugation is also a critical step in mitigating the toxic effects of PEI. Increasing the number and volume of rinses improves cell survival, but decreases the yield of transfected cells (data not shown). Clearly, such parameters must be tailored to the specific type of cell under investigation. Altering the ratio of DNA to PEI also affects the yield. In our neuronal cultures it appears that the DNA: PEI ratio of 1 μg: 5 μg, or 0.2, which produces complexes that bear a net positive charge, produces the highest yield. This is in contrast to previously published data showing that positively charged complexes and neutral complexes produce comparable yields in lung epithelial cells . However, considering that the optimal DNA: PEI ratio may vary from cell line to cell line , this is not an unexpected finding. Perhaps the most attractive aspect of PEI-mediated gene delivery is the flexibility of the method. For example, a DNA/PEI ratio of 0.4 also produces reasonable numbers of transfected neurons in our system, meaning that the measurement of the DNA and PEI solutions need not be rigorously accurate for the transfection process to work. The applications can vary greatly, as well. PEI may be used in conjunction with adenovirus vectors [2,9,11,18,19] and can be conjugated to various ligands for targeted gene delivery [10,16] or to minimize nonspecific interactions with blood when injected into the circulatory system . It also has been shown to be effective as a vector for in vivo transfection in the mouse brain [21,22] and lung [17,21], as well as a potential way to target therapeutic genes to tumors . Our results confirm the findings of others that show the possibility of transfecting post-mitotic, fully differentiated cells using PEI [2,23]. In addition, we show that adult human retinal neurons, which have been fully differentiated as long as seven decades, are capable of expressing foreign genes when administered in this manner. As the eye is considered to be the most accessible part of the central nervous system, any method of gene transfer that works on human retinal neurons in vitro presents an attractive avenue of research for potential in vivo applications. Co-transfection of SCG neurons using PEI. Neurons cultured from perinatal rat SCG were transfected with 1 μg LacZ, 1 μg EGFP, and 5 μg PEI on the fifth day in vitro. Three days later, cells were fixed and immunostained using a monoclonal antibody to β-galactosidase with a rhodamine-conjugated secondary antibody. Panel (A) shows a phase-contrast image of two neurons stuck together. The neuron on the left in (A) is expressing β-galactosidase (B) as well as EGFP (C). Scale bar = 20 m.
In vitro adult human donor retinal cells can be transfected using PEI. (A) and (B) show grayscale confocal microscopic images of retinal cells expressing EGFP. The two large cells to the right in (A) are glia, most likely astrocytes; the process-bearing cells on the left in (A) and in (B) are neurons. Scale bar = 17 μm in (A); 10 μm in (B). Sympathetic neuronal cultures were obtained by dissociating superior cervical ganglia from perinatal (21 day embryos to 1 day postnatal) Holtzman rats (Harlan Sprague-Dawley, Indianapolis), using previously described methods . Neurons were plated at ∼ 30 cells/mm2 onto coverslips coated with poly-D-lysine (200 μg/ml). Cultures were maintained in a serum-free medium  containing β-nerve growth factor (β-NGF, 100 ng/ml). In order to eliminate nonneuronal cells, cultures were treated with the DNA synthesis inhibitor cytosine-β-D-arabinofuranoside (2 μM) for 48 h beginning on day 2. Adult human donor eye tissue was obtained postmortem from Upstate New York Transplant Services (Buffalo, NY) with approval from the Health Sciences Institutional Review Board. Familial consent for donation and research was also obtained. Tissue was rejected if harvesting did not occur within 7 hours postmortem and 48 hours of storage on ice, or if the donor had a history of eye disease. Dissociated human retinal cultures were derived from adult donor tissue using a protocol adapted from goldfish retinal explant studies . Retinal isolates were diced into 0.3 × 0.3 mm pieces using a tissue chopper (Brinkman Instruments, Westbury, NY), followed by sequential treatment with 0.1% hyaluronidase/0.05% collagenase and 0.25% trypsin (GIBCO, Grand Island, NY) in Ca2+/Mg2+-free HBSS. After several rinsing/centrifugation cycles, a flame-polished pipette was used to dissociate the cells. Cells were then pelleted, resuspended, and plated onto 18 mm glass coverslips coated with poly-D-lysine (100 μg/ml) and laminin (10 μg/ml). Culture medium consisted of 1:1 DMEM/F12 supplemented with 10% FCS, insulin (10 μg/ml), transferrin (20 μg/ml), 0.1 units/ml penicillin, and 0.1 μg/ml streptomycin. Transfection took place on the fifth day in vitro for sympathetic neurons, 1-4 weeks in vitro for retinal cultures. Sympathetic neurons were treated with 2.5% fetal calf serum immediately prior to transfection. The total volume of media in each 20 mm well was ∼ 1 ml. The two plasmids used encoded either a 1.6 Kb β-galactosidase gene sequence from E. coli or the enhanced green fluorescence protein (EGFP) gene (Calbiochem, Palo Alto), and were purified by the CsCl method. Various concentrations of plasmid and PEI (ExGen 500, MBI Fermentas, Hanover, MD) were prepared, using 150 mM NaCl in sterile water as the diluent. PEI and plasmid were mixed together and incubated for 10 minutes at room temperature to allow for adequate binding of the plasmid to the PEI. One hundred μl of plasmid: PEI solution was added to each 20 mm well and the 12 well plate was centrifuged at 500 x g for 5 min. After centrifugation, the cultures were washed once with 0.5 ml DMEM, treated with 0.5 ml serum-free media containing 0.1 units/ml penicillin and 0.1 μg/ml streptomycin, and returned to the incubator. Detection of enzymatic activity within cells transfected with the β-galactosidase gene was similar to that described by Galileo et al. . Briefly, cells were fixed for 20 minutes in 4% paraformaldehyde. After rinsing with PBS, cells were incubated in the dark (20 h at 37°C) in a buffer containing X-gal substrate (1 mg/ml), potassium ferricyanide (100 mM), and potassium ferrocyanide (100 mM). Coverslips were washed in PBS and mounted on slides using an elvanol-based medium . Cultures were fixed in 4% paraformaldehyde for 20 minutes. Cells were then permeablilized in 0.1% Triton in PBS for 3 minutes and blocked in a 10% goat serum, 5% bovine serum solution for 20 minutes. Mouse monoclonal Ab 5B88 to β-galactosidase (GIBCO) was used at a concentration of 2.5 g/ml, followed by rhodamine-conjugated, affinity-purified goat anti-mouse IgG antibody (Boehringer Mannheim, Indianapolis, IN). Mouse monoclonal Ab SMI52 to microtubule-associated protein 2 (Sternberger Monoclonals, Baltimore, MD) was used at a concentration of 2 μg/ml, followed by the rhodamine goat anti-mouse secondary. We would like to thank Dr. Hu-Peng and Jason Myers (Molecular and Structural Neurobiology and Gene Therapy Program, Department of Anatomy and Cell Biology; State University of New York at Buffalo, Buffalo, NY) for their help in producing the plasmids. This work was supported by NSF grant # IBN 9808565 (DH), NSF grant # IBN 9728923 (MKS), NIH grant # HL-49376 (MKS), and the Parkinson's Disease Foundation (MKS).